Welcome to NPN Schools! NPN’s Online Directory, My Directory and School Fairs put must-have information at your fingertips. We work with public and private schools and daycares, and make it a priority to help you make the best decision for your family. Please always contact individual schools/daycares to confirm application deadlines, program specific information, and license/accreditations. For more than 30 years, NPN has been the #1 source for Preschool & Elementary School search in Chicago. Join today to make sure you have the support you need to find the best school options for your family! This members-only benefit is just another reason to become an active part of our non-profit community. 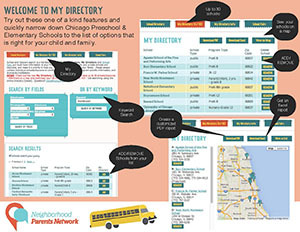 Check out the My Directory (User Guide) - search and save up to 30 schools/daycares - view them on a map and download your list to Excel or a customized PDF. Get searching using the online directory (below). SCHOOLS AND DAYCARE CENTERS- Get listed in our School Directory! Click here to add/change your FREE listing. Members, please sign-in to the website to use the School Directory.